Western Toad is a medium sized toad species the grows to a lenght of 5.5 to 13cm long. 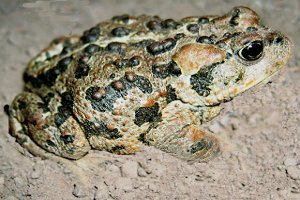 There are two subspecies of Western toads, but only Bufo boreas boreas occurs in Canada from western British Columbia up to Alaska, with some observation reports in Yukon and Northwest Territories. Western toad is also the only toad specie that lives in British Columbia. Western toads doesn’t have cranial crests and are gray to greenish in colour with a pale dorsal stripe and skin glans concentrated inside the darker part. They have a lot of oval parotoid grand larger then their upper eyelids. Juvenile western toads doesn’t show the dorsal stripe. Western toads can be found far from water when the humidity goes up but when the climate is dryer, it tends to stay close to water. The breading season of Western toads range in March and July in mountainous habitats and as early as January in lower-elevation habitats. Female lays more than 17000 eggs forming strings that fixed themselves to rock and vegetation. The eggs develop rapidly and tadpoles hatch after 3 to 12 days and transform into juvenile toads in another 6 to 8 weeks. Western toad juvenile become sexually mature in their second or third year. Western toads are mainly nocturnal but at higher elevations they tend to show more diurnal behaviour. They mostly feed on insect like beetles, ants, worms, slugs or spiders. Western toads faces many predators like birds, bears, coyottes, foxes but their main predator is the garter snake that can tolerate western toad poisonous skin secretions..